Mr. Tahvanainen heads up a staff of eight maintenance personnel and a supervisor. He is a mechanical engineer with a background in power production and thermodynamics. Editorial Background: Sandvik Coromant of Fair Lawn, NJ is part of Sandvik’s tooling division. The overall Sandvik Corporation employs 35,000 in one hundred and thirty (130) countries. Coromant specializes in machine tools: modern cutting tools for turning, milling and drilling with a focus on tungsten-carbide inserts. Designed to help customer continuously improve their productivity and profitability. The company has held ISO certification since 1994. 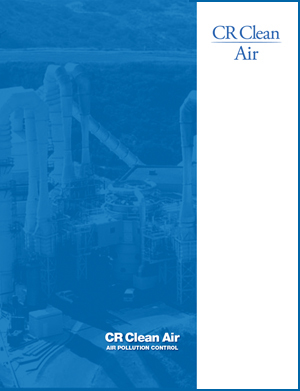 Installing The First Scrubber: The Fair Lawn facility purchased its first Clean Air Group scrubber in the late 90’s. A high-energy fixed-venturi packed-tower system designed for 1400 cfm, it can pull 57″ water column vacuum. The emergency scrubber, which plant personnel think of as a high powered, “serious” scrubber, runs 24/7, normally at half speed, at its backup stage. In case of a serious gas leak or spill it powers up to its high speed automatically. Whenever a gas detector alarm goes off, or when plant personnel change cylinders, this scrubber automatically or manually, moves to its higher RPM rating. This doubles the suction, keeping the fumes from reaching personnel and the environment, rest of the building or the outside air, while the area is safely evacuated and the problem is resolved. New Scrubber Fights Olfactory Offenses: The latest scrubber is a smaller model for a more specific purpose: intermittent use to remove the occasional unpleasant smell and similar olfactory offenses from gas separator stack exhaust when chemicals such as hydrogen sulfide, hydrochloric acid and titanium tetrachloride are handled. As part of its standard pollution-control arrangements, the plant employs water-sealed vacuum pumps combined with gas separators. This eliminates the harmful fumes, but occasionally, even after the effluent is treated, the putrid smell of H2S remains. It is not inherently unhealthy but it is terribly offensive to the human nose. A number of treatment methods had been tried over the years at the Fair Lawn facility, but the situation was never fully resolved. After careful study, the new solution, which has finally solved the problem, was to reroute the stack exhaust into a device that could eliminate the smell. Incineration was also considered, but was rejected due to high operating and installation cost. 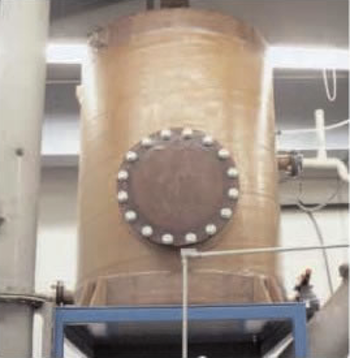 The most cost-effective method, as suggested by application engineers the Clean Air Group was the scrubber. Jet venturi scrubber mounted on a separator tank, rated 700 cfm. It’s a standy system, used primarily to remove the “unpleasant” smell of hydrogen sulfide from plant air. Tungsten carbide inserts are the only product of the Sandvik Cornomant Fair Lawn facility. The inserts are small, but sold by the millions each year to the metal working industry. Design Details: The 700 cfm stage unit employs an 8″x8″ jet venturi mounted on a 48″ diameter separator tank, and operates at atmospheric pressure and 70 F, pulling 4-5″ vacuum for use in conjunction with the plant’s gas separator stacks. It is vertically skid-mounted to save valuable floor space in the plant. Hydrogen sulfide and HCl can both be scrubbed easily in a single stage with sodium hydroxide, a dilute aqueous caustic. The unit removes 60% of hydrogen sulfide and 90% of hydrogen chloride. The scrubber is 10 ft tall with 8″ gas connections and a 24″ manway. It is made of fiberglass FRP Atlac 382 with a Nexus veil to add stability. Inside the nozzle is a Teflon spinner to add turbulence to the liquid and improve the flow pattern. The separator tank itself is also Atlac with Nexus veil, with a small polypropylene mesh pad mist eliminator at the element discharge. Since the unit operates at essentially atmospheric pressure it is not considered a pressure vessel and does not require a metal shell. The fiberglass material is highly corrosion resistant, very light and relatively inexpensive, more than adequate for its intended intermittent use.